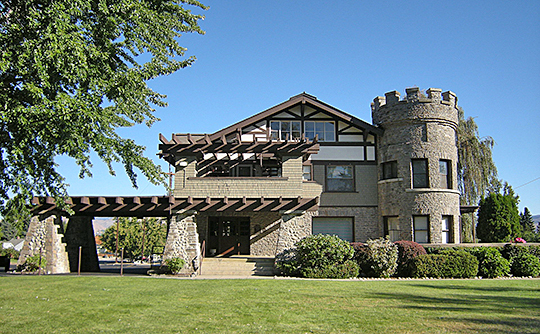 Wenatchee City Hall is located at 129 South Chelan Avenue, Wenatchee, WA 98801; phone: 509-888-6204. Photo: Wells House, ca. 1909, 1300 5th Street, Wenatchee, WA. Listed on the National Register of Historic Places in 1973. Photographed by Joe Mabel (own work), 2008, [cc-by-3.0 (creativecommons.org/licenses/by/3.0)], via Wikimedia Commons, accessed September, 2017. Situated in a fertile valley in central Washington at the confluence of the Wenatchee and Columbia Rivers, Wenatchee is the second most populous city in the central part of the state and serves as the seat in Chelan County. To the south and west, the Wenatchee Mountains provide a dramatic backdrop for the city. The area was originally inhabited by Native Americans and named after its indigenous people—Wenatchi. The story of the West is tightly connected to the coming of the railroads, and Wenatchee is a prime example of a town that burgeoned as a result of the Great Northern Railroad's arrival in 1892. The original town site of Wenatchee was established in 1888 and was located one mile north of the present site. In 1892, a new town site was surveyed and platted by the Wenatchee Development Company. On August 28, 1888, the original town site of Wenatchee was platted, by Don Carlos Corbett about one mile north of the current town site at the north end of Miller Street. Corbett named the town after Chief Wenatchee. Between 1889 and 1892, eight more additions to the old town were platted as more and more settlers came to the area. Wenatchee's population was 108 in May of 1891. By January of 1892, the population had increased to 300. The year 1892 became a significant one in the town's history because of the Great Northern Railway's decision to build its train depot about one mile south of Wenatchee, thus creating a new town. City of Wenatchee, WA, Downtown Wenatchee Cultural Resource Survey Report, 2007, www.wenatcheewa.gov, accessed September, 2017.